Business premises on George Street, vacant as of October 2017. Still vacant as of February 2018, June 2018, and October 2018. Part of the building was previously occupied by Demon Recruitment, but by October 2017 this had moved to Weatherill House, 23 Whitestone Way, CR0 4WF. 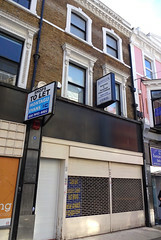 The premises were previously occupied by Rio pawnbrokers photo, then vacant for a while photo before Demon moved in. Last edited 2018-10-28 11:40:57 (version 32; diff). List all versions. Page last edited 2018-10-28 11:40:57 (version 32).